High resolution videos pose a heavy load on the system at the moment of editing. This happens not only because of the frame size but also because cameras, when recording, typically use temporal estimative codecs (such as the h264) to compress the files, increasing the CPU that has to be used to decompress them and generating imprecision during cutting, due to the interval between keyframes that store the main information. That’s why, when starting an editing project, it is common to decrease the resolution of the footage and, when doing so, use intraframe compression codecs such as the ProRes or the MJPEG. In those codecs, all the relevant information regarding compression is stored in every frame, as opposed to in keyframes positioned at every 30 or 60 frames. These smaller resolution files are called ‘proxies’ – a term used to define anything that will serve as intermediary, usually for a certain period of time, to get you to a certain end. In our case, we use videos close to SD (or standard definition) as intermediaries, so that our system gets lighter when doing the cuts, the most time-intensive task of the editing process. By the end of the project, we switch back to the high resolution files for color grading and final render. Velvet Revolver aims to automate the generation of proxies so that you don’t have to worry about all the technical stuff. And once you will not want to start a complex editing project using videos in h264, or with different framerates (FPS) due to a Blender limitation in mixing them, the addon also allows for the creation of copies of your original material using the ProRes422 or MJPEG codecs, which are the best formats for video editing. Proxy generation or the creation copies at full resolution can be done together or separatelly. As shortcuts, Velvet Revolver uses Ctrl+Shift+P to make the timeline point to the high resolution videos and Ctrl+Alt+P to make it point to the low resolution versions. Having said that, a typical description of an editing project using proxies would be: record the videos; copy them to the computer; use Velvet Revolver to generate the proxies and, if you want, full resolution copies in ProRes or MJPEG; let the machine work on this generation while you go do something else, such as have luch, get rest or go out on a date; use the proxies to do the cuts and establish a narrative line; do many intermediate renders still at SD resolution to check on how the video is getting. With the cuts made and when you get to a final version, the process is: use Velvet Revolver to point the project to the high resolution videos (at 720p, 1080p or higher); do the color grading and do the final render. The table below, result of research made in early 2013 as part of the workflow for the Red Forest project, shows why it’s interesting to edit using proxies. A project that uses proxies in MJPEG and audio in PCM will generate the intermediate renders almost 4x faster than the same project in high resolution. The codec choice also influentiates radically the speed in which it is done: the same project using proxies and rendering using the MPEG4 and PCM codecs will do so 5x faster than if it used the H264 and PCM codecs, and 16x faster than a high resolution project rendering using the H264 and PCM codecs. All tests were made using the Matroska container (extension .mkv). Notice that rendering the project during the editing phase is something that is done many times, making those numbers particularly relevant. The same observation is valid for renders that use still images as basis – something useful, for example, for final rendering, already with color grading done. Rendering frames in JPEG or TGA is quite faster than in TIF (7x and 4x, respectively) and brutally faster than using PNG (35x and 20x, respectively). See below. To install Velvet Revolver, click on the link below to go to the Download Area of the website. Once downloaded, the file with Velvet Revolver (velvet_revolver.py) is inside a zipped folder, together with the other Blender Velvets addons. Open it as you would with any regular .zip file and extract them to some place of your choice (for example, at the Desktop). 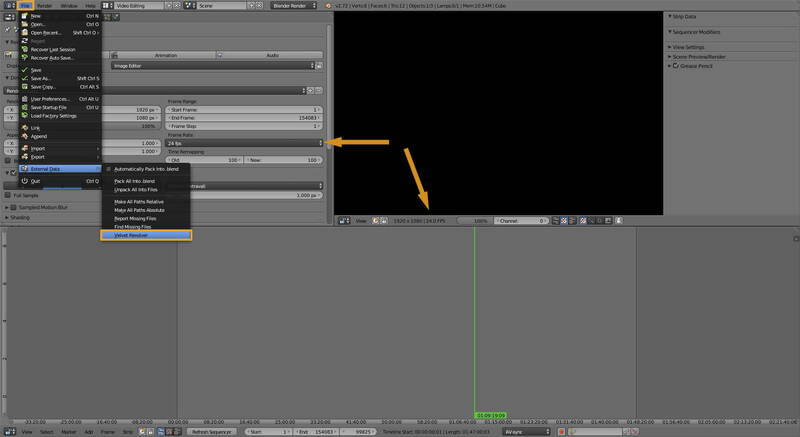 Follow the detailed instructions on how to install Velvet Revolver at the How to install the addons section from the page How to configure Blender for video. Pay attention to the instructions related to FFMPEG. After that, define the framerate (FPS) of your project as described on the section How to start a project for video editing. Image 1: With the framerate for the project set (in this case, at 24 FPS), go to the main menu and go to: “File > External Data > Velvet Revolver”. 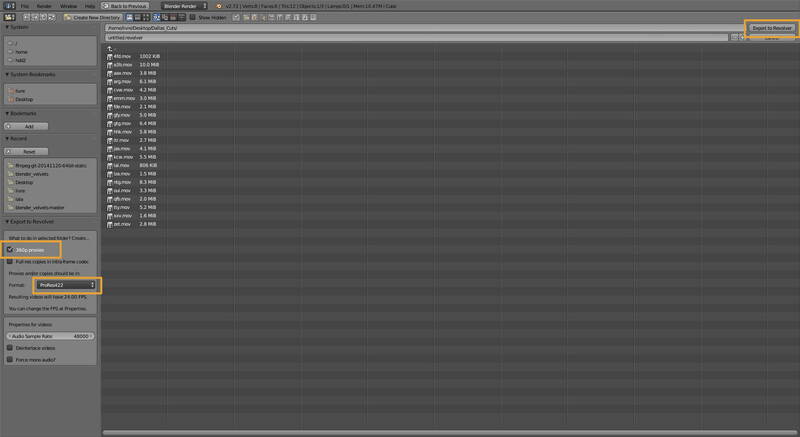 Note: The images shown here already use Blender’s modified interface. See the page Space Sequencer – Modified version to know how to install it. Image 2: Notice that Velvet Revolver’s panel is placed on the lower left area of the screen. 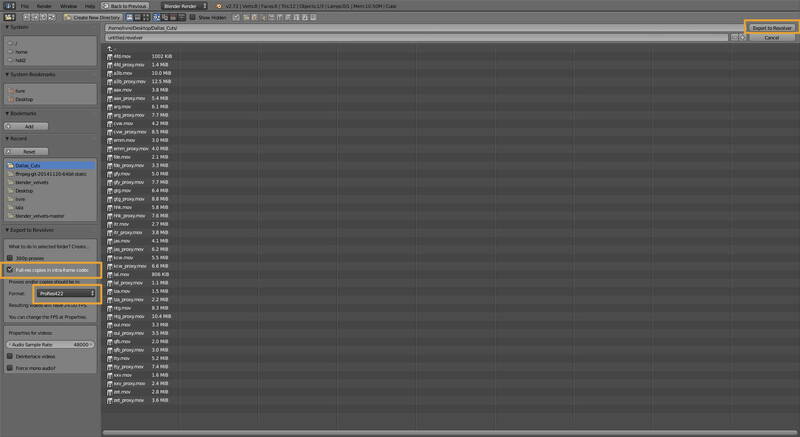 Navigate with Blender until you find the folder where the videos you will use for the project are. Since Velvet Revolver will always process all vídeos inside the chosen folder, in case you forget or want to add other videos to your project later on (this will definitely happen), create another folder, run the addon and then move those videos to the ones you already have. 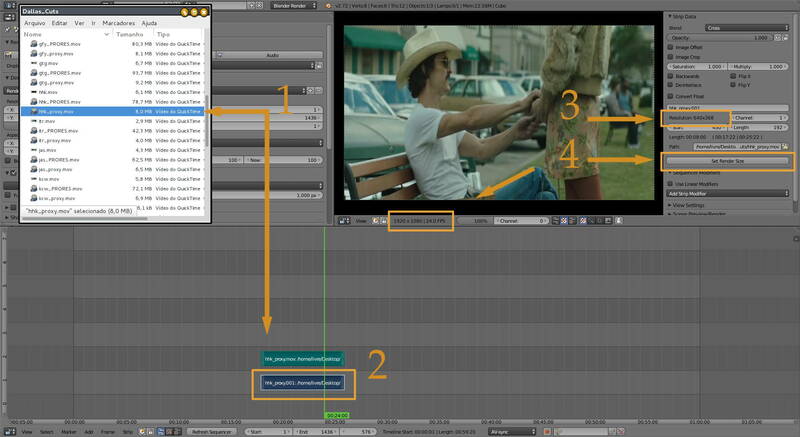 Image 3: On the detail, we see the options for what we can do with the videos. At this moment, we’ll create only the proxies in low resolution at 360p (640×368 pixels). There are two formats available for transcoding the videos: ProRes422 and MJPEG. Both codecs use intraframe compression only, being, therefore, the most recommended for video editing. 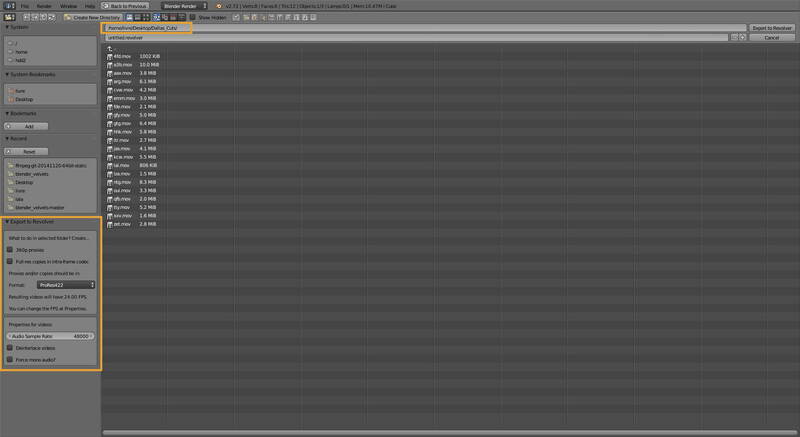 Notice that the resulting videos will have the same FPS as the project (in this case, 24 FPS). Image 4: With the options set, click on the “Export to Revolver” button, on the upper right part of the screen. The window will freeze for the duration Blender will take to process all the videos. This is to say that the longer your videos are and the more videos you have inside your chosen folder, the longer it will take FFMPEG to transcode them. 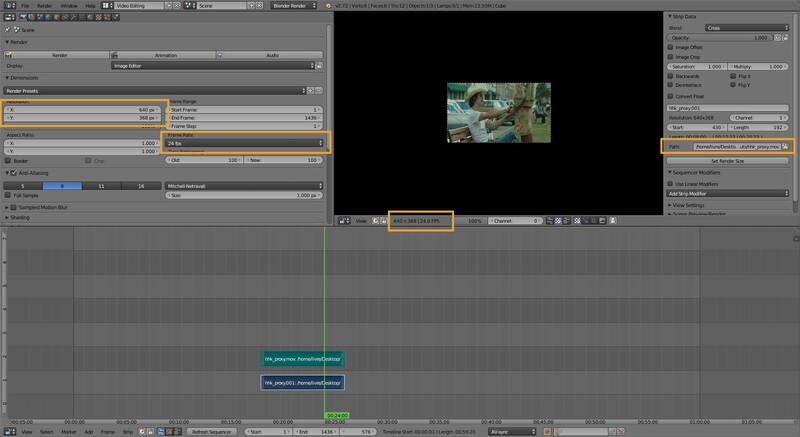 Image 5: At the end of the processing, Blender will be back to the Video Sequence Editor interface. Image 6: We’ll now create high resolution copies of the videos in ProRes422. Notice that this could have been done together with proxy creation. As written at the section about Blender’s limitations and at the end of the section on How to configure Blender for video editing, the program has no support for motion-compensated frame interpolation. 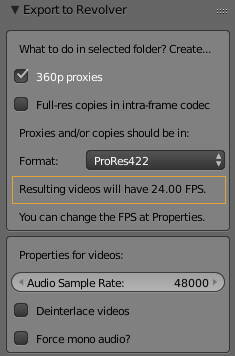 If you have videos with different FPS, you will have to create high resolution copies to mix them in Blender. Image 7: The copies are created. Proxies names end with “_proxy.mov” while the ProRes442 copies names end with “_PRORES.mov”. Drag one of the proxies to your timeline (1) and click on the video strip – it’s the dark blue one (2). We see that the proxy resolution is 640×368 (3), while the project is still set at 1920×1080 (4). Click on the button “Set Render Size” to change the project’s resolution to be the same as the proxy’s. 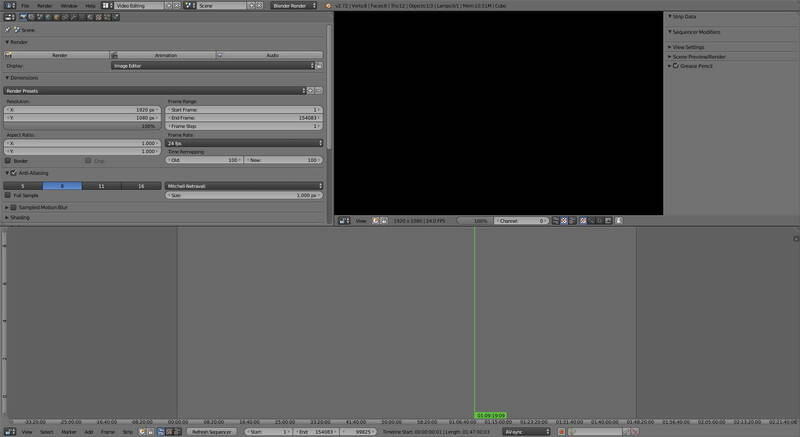 Image 8: When you do that, the video displayed at the Monitor shrinks as the project downsizes to the proxy resolution. If we take a look at the path used as reference to the video, we see that it ends with “_proxy.mov”. Image 9: The shortcuts for Velvet Revolver are Ctrl+Shift+P to reference the video strips to their high resolution versions and Ctrl+Alt+P to reference them to their low resolution proxies. 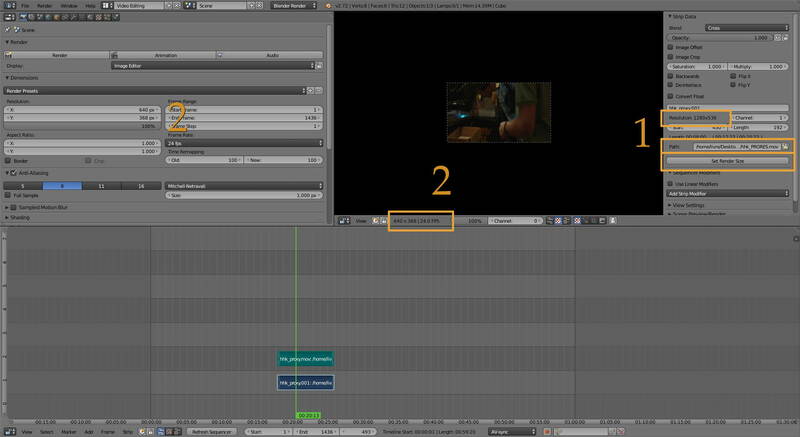 On this image, we see that the video strip is being referenced to its high resolution file (1), while the project still bears the characteristics of the proxies (2). Once again, select a video strip from your timeline and click on “Set Render Size”. Image 10: When you do that, the video being shown at the Monitor increases in size as the project shapes itself to the resolution of the selected strip (in this case, 1280×536). Use proxies and the project at low resolution to edit; once the cuts are final, point the videos back to the high resolution files and rise the project’s resolution.